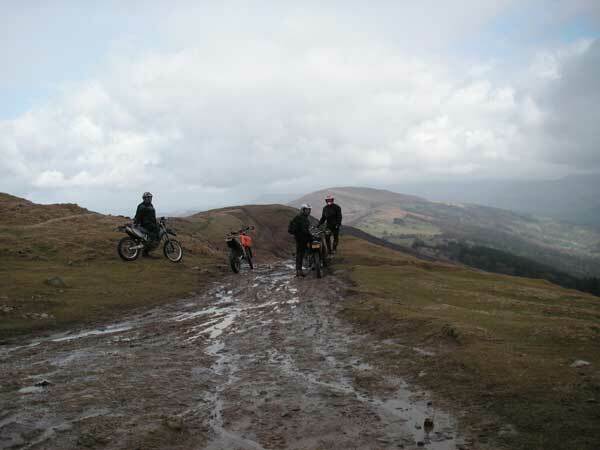 Nearly the end of March, and I hear a rumour that there's to be a trail ride over 'The Gap'. I have some time owing from work so that'll do nicely. An 8:30 start at Monmouth and gathered were Rod, Glen, Anthony, Mike and myself. 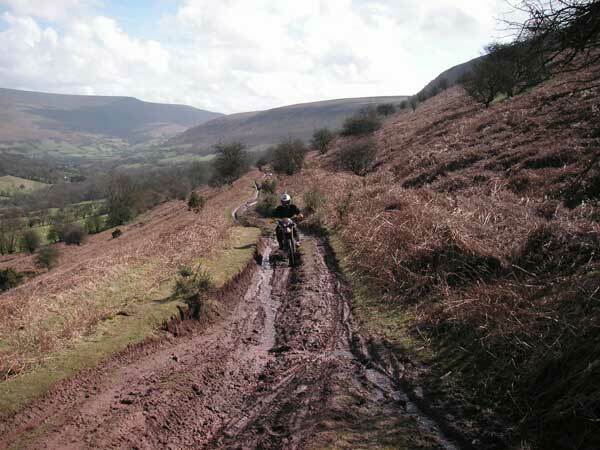 The first 20 mins were spent on the road to get to Llanvihangel Crucorney, after which Rod led us along some nice gentle but muddy lanes, eventually ending up at Crickhowell. From there we took the tarmac and a couple more lanes to the Café and garage at Cwmdu for breakfast and petrol. After 10 mins of total confusion about who was paying for what we eventually ended up with bacon bagettes, except for Anthony who got a full English - and promptly scoffed it in record time. 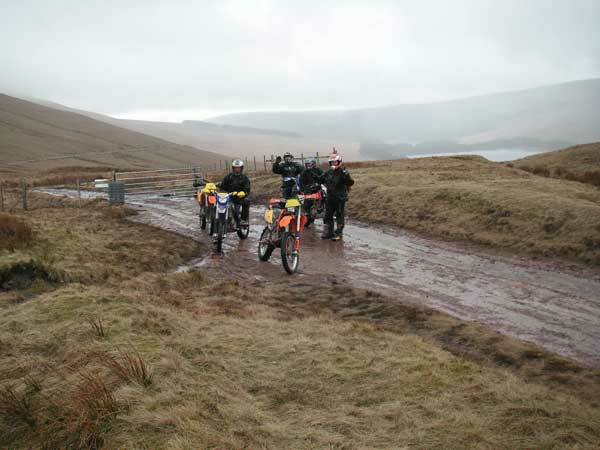 Rod then led us along the tarmac to Talybont, and up to the reservoir. The lane up through the woods to the top of the mountain is a cracker, wet and stoney. On the top, it was wet and boggy and we found the way blocked by a Landy parked sideways and a Dead jeep. Here we also met the land/jeep rescue party in another 4x4. The Landy and Jeep had been abandoned the previous day, the Landy was well stuck, and the Jeep engine was full of water - expensive day out!. We could have offered to help, but I hadn't brought my wellies. 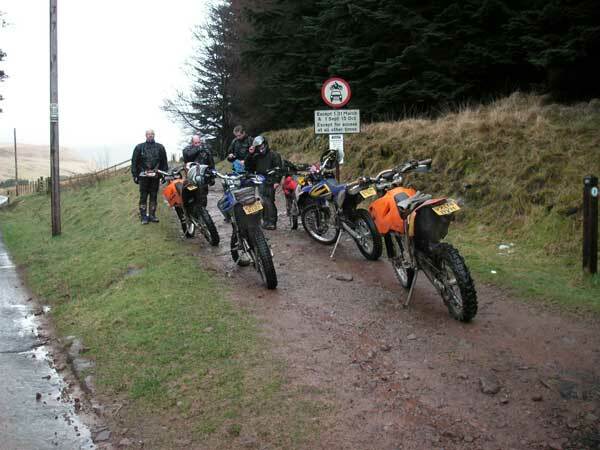 When Anthony had recovered, the remaining 4 turned round and headed back up 'The Gap'. The rocky steps at the top were a bit harder going up, but we had no more mishaps. Retracing our steps we then went back up past the Pentwyn reservoir and back towards Talybont. On the way up, we passed the 4x4 towing the Jeep and the Landy on their way down. The rain had eased off by this time, but the tracks were all pretty waterlogged by now. Pretty soon we found our way back to Talybont - navigation was best done here by ignoring Mike and his GPS which would probably have put us in the canal. 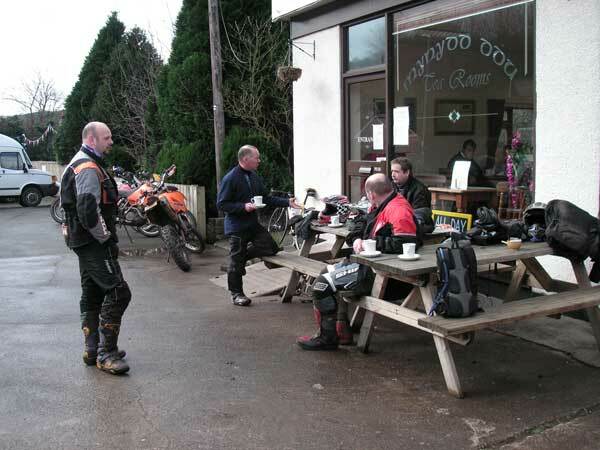 A short time later and we were back at the Café at Cwmdu for a top-up. 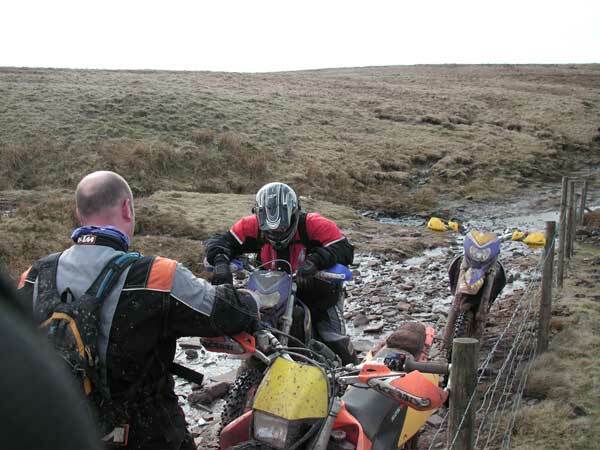 While we had bagettes, Anthony had a large chunk of bread pudding - must have needed some more ballast - I'm sure adjusting the suspension is the proper way to do it….. We then followed the highlighted route on Anthony's map, up a lovely muddy track by Cockit Hill (that's what the map says). 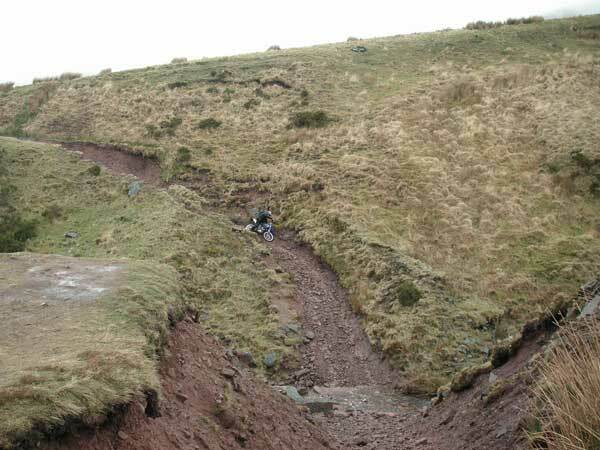 I'm not sure about the next track, it looked well used, but I'm not sure it was the one we intended to go up. Anyway, we eventually ended up at the end of 'Grwyne Fawr'. The only problem with this was that we were going up the hard way. The bottom was pretty muddy. Glen spent a moment in a fence, I ended up on my arse, and the other two appeared to get stuck for a while in some gorse bushes, but worse was to come. Halfway up are a couple of rocky hairpins. I tried to do a 'wall-of-death' ride round the first and ended up on my arse again. Mike had a go and did the same. Anthony decided to walk his shiney new Sherco up with some assistance, and then we all helped out to get the rest up in one piece. The next hundred yards were a struggle but at least we remained upright. After a few minutes to recover, we continued up the next half mile or so, up what is a fairly steep and very rocky track, to the top for another rest. Glen appeared to be dying at this point, so was very glad to be over the worst. 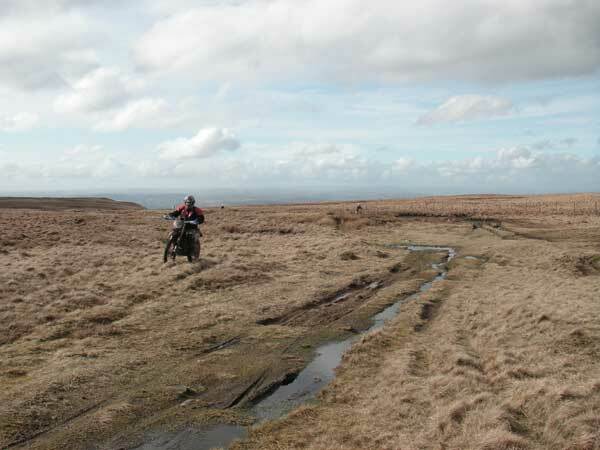 At the top is a small boggy area, after which the track is rocky but very rideable for the next couple of miles down to the Grwyne Fawr reservoir. After that we rejoined the tarmac, and headed for home as it was well past teatime! 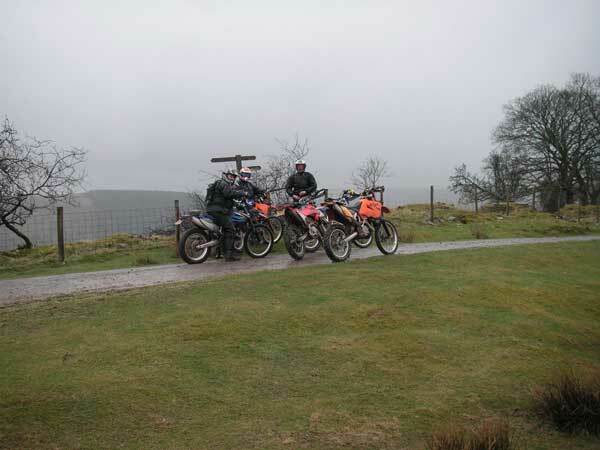 In total we did a round trip of 140 miles, a bit like doing one day of the Welsh, and it was starting to feel like it! 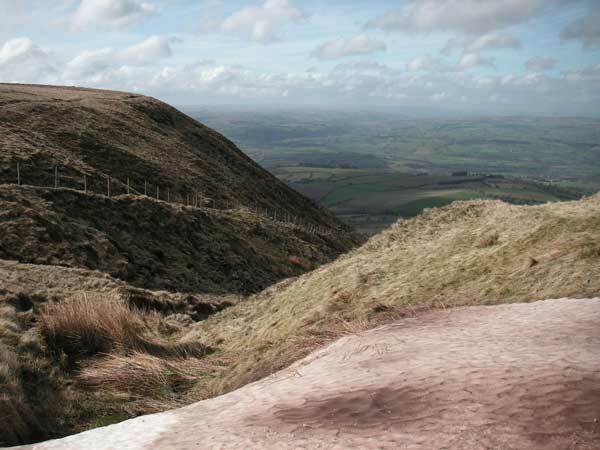 But what a brilliant day out, superb lanes, magnificent views! Thanks to Rod for leading the way out.